AAPA is pleased water resources bill is making progress in Congress. WRDA 2016 can continue the progress of 2014 act towards full use of the Harbor Maintenance Tax. Legislation puts WRDA back on a two-year cycle. The United States House of Representatives passed the Water Resources Development Act (WRDA) by a vote of 399 to 24 last week. With the Senate having approved its version of the bill on September 15 by a vote of 95 to 3, it sets the stage for the final bill to be negotiated by a House-Senate conference committee. The American Association of Port Authorities is pleased by the progress the measure has made in Congress. 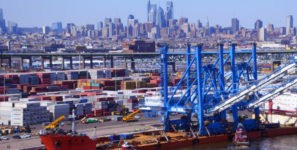 The organization believes it is crucial that WRDA be reauthorized in this Congress to address the needs of America’s ports and other water resources infrastructure, and help strengthen the nation’s international competitiveness. According to AAPA President and CEO Kurt Nagle, among the most important aspects of both the House and Senate versions of the legislation is that it puts WRDA back on an every-two-year cycle, avoiding a backlog of projects and adopting policy changes to make the system work more efficiently and fairly. Nagle also noted that Congress passed the last water resources reauthorization bill in 2014 after a seven-year hiatus. Passing it again this year will put it back, as intended, on an every-two-year cycle, which hasn’t happened since 2000.